Newstead's gluten-free bakeshop has revamped its cafe, with more room to serve its doughnuts and brunches. 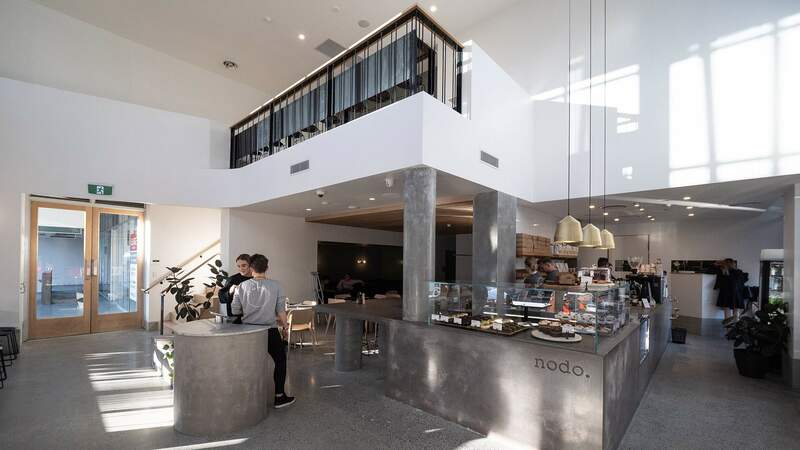 If you're a fiend for pastries but you're not so keen on gluten, then you're probably a Nodo fan. In addition to its signature dessert dish — gluten-free doughnuts that are baked, not fried — it whips up plenty of other treats. And, it's serving them up at its revamped Newstead cafe, which first opened back in 2015 and has just undergone quite the facelift. It's the latest step for the busy Ella Street spot, which initially started out slinging takeway doughnuts, then expanded to take over the space next door. In its new, concrete-heavy form — think concrete counters and polished concrete floors, plus clean lines and light-filled spaces aplenty — it now boasts an upgraded kitchen and bakery, as well as more seating. There's also table service if you're eating in and a grab-and-go system if you're nabbing a bite on your way out the door. While doughnuts and other baked goods remain Nodo's main focus, the relaunch brings something new, food-wise. That'd be brunch, so prepare to stop by mid-morning. Hungry diners can tuck into baguettes stuffed with crab and egg scramble, kimchi waffles topped with popcorn chicken, souffle hotcakes with yuzu gel and stacked brisket cheeseburgers. Then, wash it down with Coffee Supreme coffee or one of six types of healthy shakes, including chocolate, mint choc chip, coffee and caramel. Just save some room for the doughnuts, obviously.